When you start a relationship with someone -- long before you get married -- you occasionally get baffled by the films they haven't seen that you think everyone must have seen. In the case of Amanda and me, we made lists of our favourite films about four years ago and swore that one day we would have a long romantic weekend where we would do nothing but watch each other's films. It's not actually happened. A couple of times, late at night, we've downloaded and watched a film in bed, but the whole planned "I'll show you mine, you show me yours" hasn't happened. Three women in the same family (all named Cissie Colpitts) each drown their troublesome husbands – and convince the local coroner to help cover up the crimes. 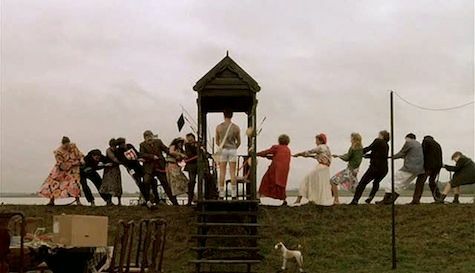 It sounds simple but in the hands of masterful visual artist Peter Greenaway, the film becomes a baroque meditation on the nature of life and games – and the game of life. Alejandro Jodorowsky’s wildly unrestrained flights of cinematic psychedelia are legendary midnight movies and SANTA SANGRE is no exception. Fenix, the scion of a circus family has entered an asylum after witnessing his mother commit a heinous crime and get both her arms cut off. Eventually she secures his release and forces him to become her arms. Lindsay Anderson’s searing excoriation of British boys school traditions features the screen debut of Malcolm McDowell. This counter-culture cult classic screened for over five years straight in Cambridge during the late ‘60s and one can see why. Alan Bates plays a Scottish WWI soldier dispatched to disarm a bomb left by the retreating Germans in a French town. When he arrives he discovers that the supposedly abandoned hamlet is actually still inhabited – what he doesn’t realize is that it’s been taken over by the cheerful lunatics from the local asylum. Brattle member passes will be accepted for individual screenings at the door only. We strongly advise that you buy tickets in advance. If it's fun we may do it again.